What if science teachers had a scientist friend who invited them to go with her on a scientific expedition? Wouldn’t it be interesting and exciting? What would they learn during the trip? After returning from the scientific adventure, what could they tell their students about their firsthand experiences? Don’t you think that what they would learn during the field trip could help them make science exciting and accessible to students? Even though such a thrilling experience may not occur for every educator, books about the lives and activities of scientists can take science teachers on a similar trip. Texts about scientists and their research can describe how a scientist becomes engaged with a topic of her/his study, wonders about a set of complicated questions, and devotes her/his life to these issues. This article is intended to illustrate how we could integrate these kinds of texts into inquiry-oriented lessons and how they can increase the effectiveness of the science methods or introductory science courses. Learning about real scientific and engineering projects can help students develop an understanding of what scientists do. In science textbooks, most of the time students encounter exciting and well-established scientific facts and concepts generated by the science community, but rarely read and learn about how scientists work or generate new knowledge in science (Driver, Leach, & Millar, 1996). Helping students learn scientific practices, science teachers/educators often utilizes inquiry-oriented lessons. The National Research Council (NRC) has defined K-12 science classrooms as places in which students perform science and engineering practices while utilizing crosscutting concepts and disciplinary core ideas (2012). One of the conventional approaches to meet such expectations is to develop a series of model lessons that involve and engage students in some science investigations. Some years ago, I started a methods course beginning with these ideas and collected data investigating any changes in classroom discourses (Basir, 2014). Results of that qualitative study revealed no significant change in classroom discourse regarding science and engineering practices. Analysis of the results revealed a list of common patterns and challenges about student learning in the courses. My students had vague ideas about what it means to develop and use a model, make a hypothesis, and construct a science argument. Analysis of their reflections also revealed that the keywords associated with the eight science practices (see Appendix I) were not traceable in their written discourses about their science investigations; they had difficulties recognizing those eight practices in their science inquiry. Trying to resolve these challenges was my motive to revise this methods course. In the following, I first describe how the wisdom of practice in science education helped me develop an idea to change the course and how that idea transformed into an instructional strategy. Then, I use examples to illustrate results of this instructional strategy. The presented instructional approach aids students using NGSS framework accurately when they reflect on their science practices and consequently learn science practices more effectively. Hopefully, this could have a positive effect on their science teaching. The apprenticeship model (getting engaged in science inquiry while being coached by a master teacher) has been emphasized as a practical and useful approach for learning and teaching science since decades ago (e.g., NRC, 2000). NRC (2000) defined science inquiry by introducing a set of abilities for a process of science inquiry and NRC (2012) has placed more emphasis on those abilities and call them the eight science practices (see Appendix I for the comparison between the set of abilities and the eight science practices). The eight science practices as defined by NRC (2012) and those abilities for science inquiry as defined by NRC (2000) are very similar. However, as Osborne (2014) asked, in what sense the notion of inquiry as defined by NRC (2000) differs from the science practices defined by NRC (2012). One reason, among others, is about the call for more transparency on the articulation of what classroom science inquiry is or what students need to experience during an inquiry-oriented lesson (Osborne, 2014). Aiming to develop such transparency in methods courses for prospective teachers, we may need to consider some complementary instruction to the apprenticeship model. This means that while teachers and students follow the apprenticeship model of teaching and learning, they need to become more conscious about and cognizant of science practices. As a complement to the apprenticeship model of instruction, to some extent, many instructional methods can help students learn science investigations by learning about history and/or nature of science (Burgin & Sadler, 2016; Erduran & Dagher, 2014; McComas, Clough, & Almazroa, 2002; Schwartz, Lederman, & Crawford, 2004), refining their investigative skills (e.g., Hackling & Garnett, 1992; Foulds & Rowe, 1996), conducting context-based science investigation using local newspapers or local environmental issues (e.g., Barab & Luehmann, 2003; Kuhn & Müller, 2014 ), and becoming cognizant of what/how they do science (e.g., Smith & Scharmann,2008). In the context of higher education, active learning as an instructional approach provides multiple opportunities for students to initially do activities during class and subsequently analyze, synthesize, evaluate, and reflect on what they did during those activities (Bonwell & Eison, 1991). This latter aspect of active learning, critical thinking, plays a significant role in the effectiveness of teaching (Cherney, 2008; Bleske-Rechek, 2002; Smith & Cardaciotto, 2011) and usually is a missing component in the mentioned context. Unlike the regular introductory university-level science courses, in the context of science teacher preparation, it is a common practice to ask students to write a reflection about what/how they do activities. What has been less emphasized in this context is to provide a framework and benchmark helping students to systematically reflect on their science investigation (Ellis, Carette, Anseel, & Lievens, 2014). The stories or case studies about how actual scientists do science can function as a benchmark for students who do classroom science investigations. Comparing an authentic science study with a student-level science project can make students aware of possible deficiencies and missing components in their classroom inquiry. Presumably inspired by medical science, case study teaching approaches have been utilized for teaching science (Herried, 2015; Tichenor 2013) and showing promising effects on student learning (Bonney, 2015; Tichenor, 2013). Specifically, science educators have developed many case studies for how to teach science—many of these cases related to science methods are available at National Center for Case Study Teaching in Science (NCCSTS; http://sciencecases.lib.buffalo.edu/cs/). In this paper, I describe how particular kinds of case studies, the stories of contemporary scientists and their projects, can be used as a complementary teaching component to inquiry-oriented instruction. The objective is to provide an environment in which students could see the “sameness and difference” (Marton, 2006) between what they do and what scientists do. They could use the stories about actual science investigations as a benchmark for reflecting on what they do in the science classroom. Drawing on the reviewed literature, I developed a three-phase instructional approach (Figure 1). In each phase of the instruction, students are assigned with specific task and concurrently reflect on that task. 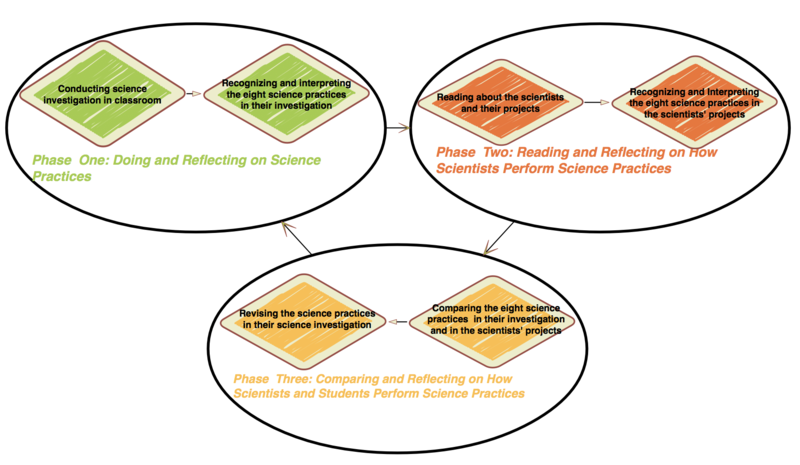 In the first phase, students have multiple opportunities to do science investigations, compare and contrast how they did across the small groups, recognize and interpret the eight science practices in their work, and document their reflection about how they do science on the offered template (Figure 2). 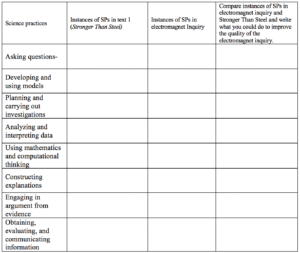 This activity helps students conceptualize the eight practices implicitly embedded in those inquiry-oriented lessons. In the second phase, students read and reflect on a case study (i.e., a book about a scientist and her/his project). By reading about scientists and scientific projects, students have the opportunities to discern first-hand instances of the eight science practices. In the third phase, students compare those first-hand investigations done by real scientists, as benchmarks, with what they do in inquiry-oriented lessons and accordingly critically reflect on how to improve their science practices. Figure 1 (Click on image to enlarge). Illustrates the suggested learning cycle. Figure 2 (Click on image to enlarge). 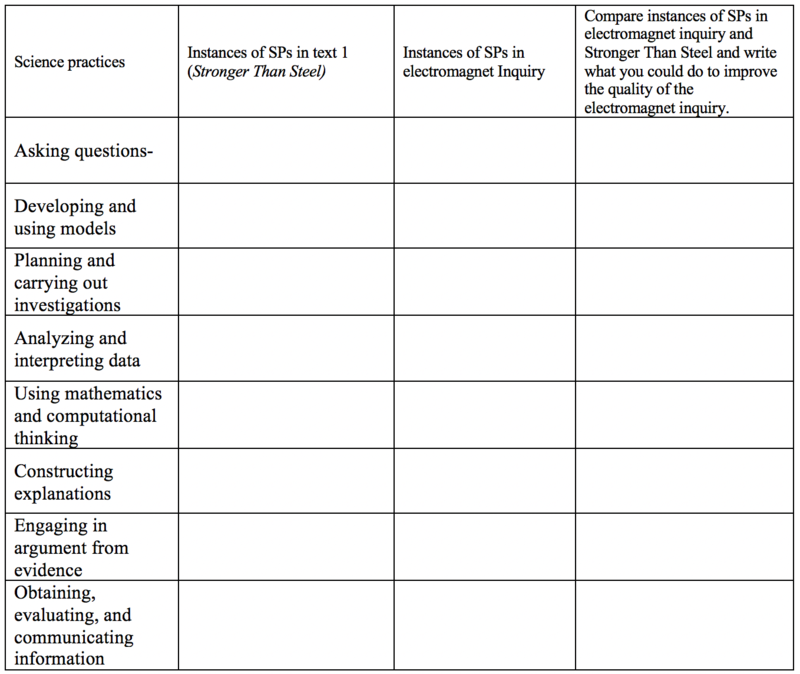 Template for comparing instances of science practices (SP) in different contexts. In the following, a three-session lesson (about 4.5 hours) based on this instructional approach is presented. Currently, this lesson is included in one of my science courses (how to do straightforward scientific research). The course is a general education course open to all majors, and secondary and middle-level pre-service teachers are required to take the course. In my previous institution, a similar lesson was included in a science course required for prospective elementary teachers. In this phase of the learning cycle, students conduct a science investigation and are asked to match the eight science practices with different components of their science inquiry. Students are required to document their interpretations in the provided template (Figure 2). Students are given a worksheet for investigating electromagnet. The very first question in the worksheet is about drawing an electromagnet. This question aims to check how much they know about electromagnets. 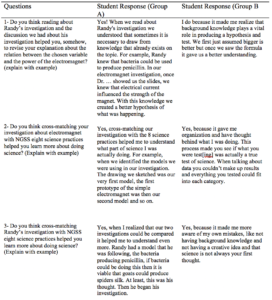 Figure 3 shows five student responses to the mentioned question. These are typical responses at the beginning of this investigation. Most students know little about electromagnets. 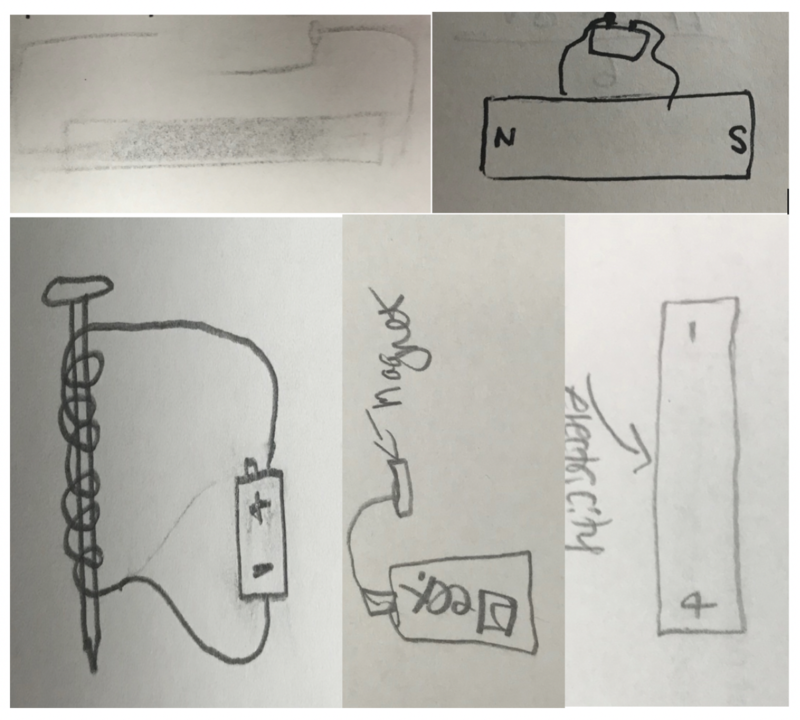 After receiving these responses, I put students in small groups and made sure that each group had at least one student who drew a relatively correct preliminary model of an electromagnet. Due to space limitation, only four of the eight science practices have been discussed in the following. Figure 3 (Click on image to enlarge). Illustrates how students drew the model of an electromagnet as their initial idea. Asking Questions. Students, as a group of four, were given different size batteries, nails, wire, and paper clips. They were supposed to make an electromagnet and then they were given a focus question: how you can change the power of the electromagnet. Some groups had difficulty building and/or using their electromagnet due to issues such as a lousy battery, open circuit, not enough loop, trying to pick up a too heavy metal object by the electromagnet. With minor help from me, they were able to build the electromagnet. Some groups developed yes-no questions (i.e., does the number of loops affect the electromagnet?). I helped them revise their question by adding a “how” to the beginning of their question. Typical questions that students came up with which focused the small group investigations were: How does the voltage of the battery affect the power of the electromagnet? How does the amount of wire around the nail affect the strength of the electromagnet? How does the insulation of the wire affect the power of the electromagnet? Developing and Using Models. Scientists utilize scientific models and discourses to explain the observed phenomena. However, students usually use vernacular discourses instead of using science/scientific models for explaining a phenomenon. Students needed to develop a hypothesis related to the questions they asked. Here are two typical hypotheses that student groups came up with: 1) making the loops tighter and the wire would have a stronger effect on the nail and in turn, the electromagnet would become more robust, or 2) a bigger battery would make the electromagnet stronger. When (at reflection time) students were asked to think and explicitly mention any models they used, they sometimes talked about the picture of the electromagnet that they drew as a model of the electromagnet (Figure 2). Nonetheless, they typically didn’t see the role of their mental model in the hypotheses they made. With explicit discussion, I helped them to rethink why they generated those hypotheses (i.e., bigger battery or more loops, more powerful magnet). I expected them to mention some of the simple electromagnetic rules learned in science courses; however, most of the hypotheses stem from their vernacular discourses rather than science/scientific discourses. Through discussion with small groups and the whole classroom, I invited them to think about the background knowledge they utilized for making those hypotheses. We discussed the possible relationship between their hypotheses and the vernacular discourses such as “bigger is more powerful,” “more is more powerful,” or “the closer the distance, the stronger interaction”—These vernacular discourses are like general statements that people regularly use to make sense of the world around them. If we use a bigger battery and more wire, then we will have a stronger magnet.” Later, as they collected data, they realized that the vernacular ideas did not always work, a 9-volt battery may not provide as much power as a 1.5-volt D battery. Constructing Explanations. The relation between different variables and their effects on the strength of an electromagnet is a straightforward part of the investigation. However, most of the groups were not able to explain why the number of wire loops affects the power of the electromagnet, or why uninsulated wire does not work. One of the common misconceptions students hold is the thought that uninsulated wire lets electricity go inside the nail and makes the nail magnetic by touch. I did not tell them why that idea was not correct and then motivated them to explicitly write their thought in the template (Figure 4). Engaging in Argument from Evidence. We had different kinds of batteries, so one of the groups focused on the relationship between voltage and the electromagnet power. Through investigation, they realized that a 9-volt battery did not necessarily increase the strength of the electromagnet in comparison with a D battery. Another group focused on the relation of the number of cells and the electromagnet power. I encouraged them to discuss and compare the results of their studies and find out the relation of batteries and the power of the electromagnet. However, neither group had students with enough science background on electromagnetism to develop better hypotheses. As mentioned before, we can use many different kinds of texts about scientists and their projects for this instructional approach. 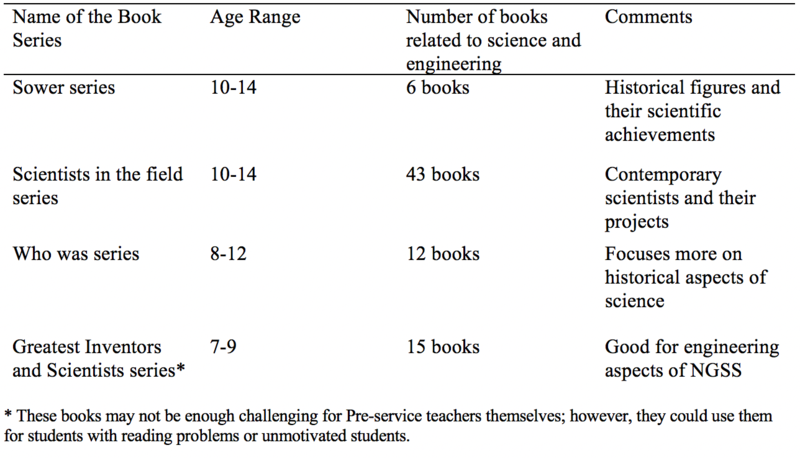 Table 1 suggests some book series appropriate for the proposed strategy. For instance, “Sower series” can help students to learn about historical figures in science and their investigation or “scientist in the filed” is about contemporary scientists and their projects. 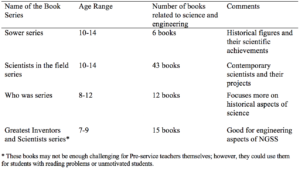 Stronger than Steel (Heos & Comins, 2013) from the scientist in the field series is discussed to illustrate how we can use these books in the classroom in the following. The summary of the book. Stronger than Steel is about Randy Lewis, his team, and his long-term research project about spider silk. Randy’s early research questioned the structure of the spider silk: how spider silk could be so strong and at the same time so flexible. By applying the well-established models and methods for the analysis of the matter, Randy and his team were able to develop an explanation for why spider silk is both strong flexible at the same time. They found out that the particular spider silk they analyzed was made of two proteins; a combination of these two proteins is responsible for super flexibility and strength of the spider silk. Building on genetic theory, the research team examined spider DNA. It took them about three years to isolate two genes associated with the proteins responsible for the strength and flexibility of the spider silk. Familiar with the transgenic models, in the late 1990s, Randy’s team designed bacteria producing the main ingredient of the spider silk, the two proteins mentioned before. In the next step, they injected those specific spider genes into goat embryos and achieved incredible results. Some of the transgenic goats were able to produce the spider silk proteins, but of course not like Spiderman. The transgenic goats are very similar to regular goats, but their body produces extra spider silk proteins in their milk. Randy’s team milked the transgenic goats, processed the milk, separated the spider silk proteins, and finally spun the spider silk fibers from the mixture of those two proteins. Currently, they are working to find alternative organisms that could produce spider silk more efficiently than transgenic spider goats. They are working on two other organisms: silkworms, which are masters in making silk and alfalfa, which is a plant that produces much protein. 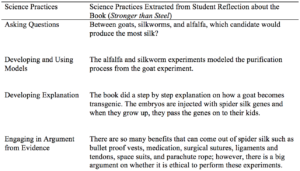 As can be seen in this summary, the book has many examples of eight science practices from the first-hand science projects (i.e., the research questions about making spider silk, the theory-driven hypothesis explaining the possibility of using transgenic methods and making silk from goats). We can use different reading strategies in this phase of the instruction. I often have students submit answers to a set of guided questions as they read the books. The objective here is to motivate students to match and interpret the eight science practices in the work of the scientists as described in the case study. 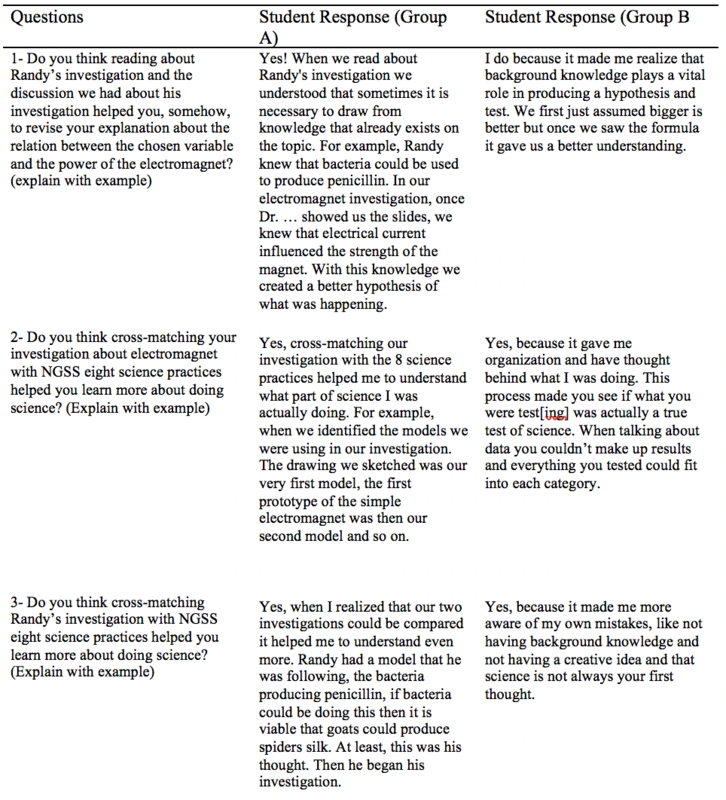 Table 2 illustrates some of the reflections that students submitted on the reflection template (Figure 2) after reading the book. In this phase of the learning cycle, students had small-group activity comparing the instances of the science practices in the case study with the instances of science practices in their electromagnet investigation. We also had a whole-classroom discussion coordinated by me. Asking questions. Randy utilized transgenic and genetic models to do the investigation. Students were asked to think about the research questions that led Randy’s work. 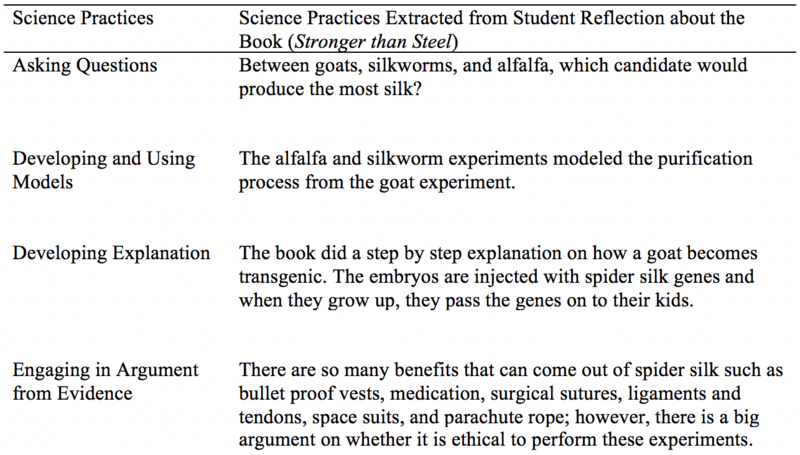 Here are the typical responses students came up with: Why is spider silk is so strong and flexible at the same time? What spiders’ genes are related to spiders’ ability to produce silk? Can other organisms produce spider silk? How can other creatures produce spider silk? We discussed how the questions in Randy’s project are model-based and theory-laden. Then students examined their electromagnet questions and tried to transform them into model-based and theory-laden questions. Figure 4 depicts how student questions changed and improved after the mentioned discussion. We discussed that if we used the magnetic field model to describe what was happening around a magnet, then we could have asked how to increase the magnetic field at the tip of the nail. By discussing the formula related to the magnetic field and the amount of electric current, students were able to ask a question about the relation of electric current and power of electromagnet instead the relation of voltage of batteries and the power of electromagnet. Figure 4 (Click on image to enlarge). Illustrates the changes in student groups, A and B, before and after of the case study. Constructing Explanations. 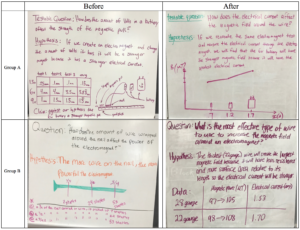 As a part of the structured reflection on the case study, students were supposed to recognize scientific explanations that Randy’s team developed. Here are some of the scientific explanations we discussed in our class: Randy’s team used the biomaterial models to understand the structure of spider silk. They figured out why spider silk is so strong and at the same time so flexible. They described how two essential proteins make the spider silk, one makes the silk stronger than steel, and another make it as elastic as rubber. Using the genetic models, they had the understanding that specific genes carry the information for the production of particular proteins. So, after a two-year examination of the spider genes, eventually, they pinpointed the two specific genes and developed an explanation of how/why those two genes are responsible for making those proteins. These discussed scientific explanations provided a rich context and a benchmark for students to improve their explanations about electromagnet. 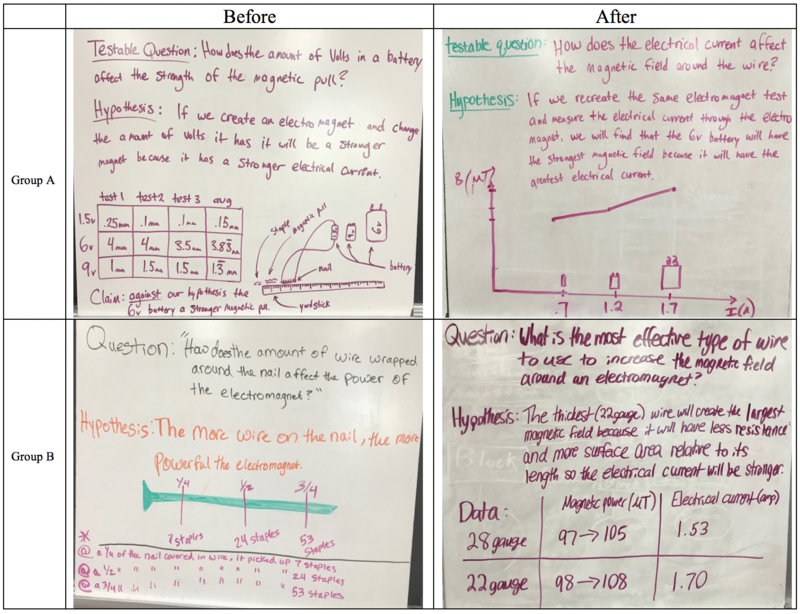 The model-based explanations in Randy’s project encouraged students to use simple electric and magnetic laws and tools for developing explanations about the electromagnet investigation. For instance, looking at the hypothesis that group A and B made (Figure 4), we could see that both initial hypotheses look like a claim with no explanation (i.e., the more wire on the nail, the more powerful the electromagnet). However, after the discussion about Randy’s project, both groups added some model-based explanations to their claims. In the revised version of their work, by measuring the electric current, group A figured out that why a 6-volt battery created a stronger magnetic field than a 9-volt battery. Group B used the formula for electric resistance to explain why electric current would increase in the coil. They also used a multimeter and Tesla meter for measuring electric current and magnetic field for collecting supporting data. In the second explanation, we had more background knowledge about the subject, so we were better able to develop a hypothesis that was backed by a scientific theory. This led to more accurate results. We also used tools that measured the exact amount of electric current and the exact magnetic strength in the second experiment. One of the explanations comes from the knowledge that we brought (which is none, or little knowledge of magnetism). The other explanation utilizes the outside knowledge that Dr. Mo presented us with. The equation that explained what makes a magnet stronger. We were then able to adjust the explanation to be more accurate. Engaging in Argument from Evidence. Some of the discussed points from the case study that are related to engaging in argument from evidence are typically either mentioned in student reflection or suggested by me. Randy’s team used the genetic theory arguing for the relation between alfalfa, silkworms, and goats. Then they collected empirical data and developed evidence for that argument. Randy’s team developed a strong argument from evidence to convince the funding agencies for exploring the alternative methods for production of spider silk. Randy is also engaged in the debate from evidence to support the claim that transgenic research is beneficial to our society. He argues that although this kind of investigation could be misused (i.e., designer babies or spread of transgenic animals in natural environments), the beneficial aspects of transgenic research are immense. In comparison with Randy’s work, we discussed how science goes beyond the walls of the science labs and how science, society, and technology are mutually related—one of the eight aspects of NOS based on NGSS is “science is a human endeavor.” Regarding this relationship in the context of the electromagnet investigation, through whole-class discussion, we came up with some library research questions: how a Maglev works or how electromagnetic field/wave possibly could have some possible sides effects on the human brain. When we read about Randy’s investigation, we understood that sometimes it is necessary to draw from the knowledge that already exists on the topic. For example, Randy knew that bacteria could be used to produce penicillin. In our electromagnet investigation, once Dr. … showed us the slides, we knew that electrical current influenced the strength of the magnet. With this knowledge, we created a better hypothesis of what was happening. This article seeks ways to improve pre-service teacher learning about NGSS’ eight science practices. This learning objective can be accomplished in the suggested learning cycle (Figure 1). As discussed, in the first phase, when students work on their science investigation, what naturally comes out of students’ work are vernacular discourses, based on their mental models used in their daily life practices, rather than science models and discourses. 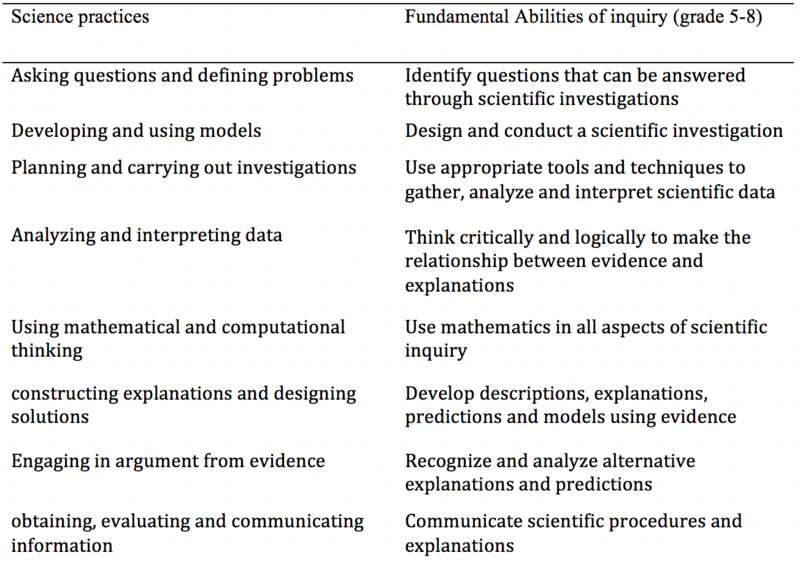 As Windschitl, Thompson, and Braaten (2008) put it, one of the fundamental problems with student science investigation is the modeless inquiry (i.e., students conduct investigations without utilizing scientific models). Here students managed to investigate variables that affect the power of an electromagnet such as the kind of battery, number of loops, size of the nail, and diameter of the loops. At this stage, however, they were not able to utilize science models to explain “why” those variables affect the strength of the electromagnet. In the second phase, due to the authenticity of the scientific project described in the case study, it was easy for students to recognize instances of the eight science practices in that project. Through reflection, students realized that the scientific investigation in the case study was vastly built on scientific models and theories. In the third phase, through the negotiation process between the students and teacher and by comparing their work with Randy’s work, a majority of the students became cognizant of the fact that the electromagnetic models were almost absent in their initial electromagnet investigation. Randy’s project functioned as a benchmark assisting pre-service teachers to compare their work with the benchmark and revise their science practices. Additionally, the comparison between classroom science and actual scientists’ work provided an environment for discussion about some aspects of NOS such as the relation of science-society-technology, and the coordination of theory-evidence. In return, those discussions helped students improve their electromagnet investigation. As a limitation of the presented strategy, it can be asked, what would happen if the case study was eliminated? Students would go through the electromagnet investigation, then I would give students the background knowledge about electromagnet, and then students would do the investigation for the second time. Probably, due to doing a similar investigation two times, we should expect some improvement in the quality of their investigation. However, the case study functioned as a benchmark and guidance. During the discussion about Randy’s work, students became cognizant of the critical role of background knowledge, modeling, and scientific lab technology for doing science. Importantly, they realized that for making hypotheses, observation and collecting data is not enough; they need to bring scientific knowledge to the table to develop a hypothesis. Accordingly, it seems that the case study provided a productive environment for students to do science investigation and learn about the eight science practices. As Hmelo-Silver (2006) stated, scaffolding improves student learning when it comes to how and why to do the tasks. The discussed structured reflection can help students learn how and why they conduct science investigations and encourage them to critically think and talk about science practices (nature of science practices). Going through multiple inquiry-oriented lessons provides an environment for students to do the NGSS eight science practices described. To develop a thorough understanding of those practices, however, students need to repeatedly think critically to discern instances of science practices from what they do, compare them with a benchmark, and find out a way to improve their science practices. By going through the concurrent reflection embedded in all three phases of the suggested instructional strategy, prospective teachers experienced the fact that classroom science investigations should go beyond a “fun activity” (Jimenez-Aleixandre, Rodriguez, & Duschl, 2000) and the vernacular discourses that they know, and must be based on scientific knowledge, models, and technology, and explicitly relate to society. I would like to show my gratitude to James Cipielewski and Linda Pavonetti for sharing their wisdom with me during the initial phase of this project. Basir, M.A. (2014). Pre-service Teacher Discourses: Vernacular Versus Formal Science Learning Discourses. Paper presented at NARST 2014. Barab, S. A., & Luehmann, A. L. (2003). Building sustainable science curriculum: Acknowledging and accommodating local adaptation. Science Education, 87(4), 454-467. Bleske-Rechek, A. L. (2002). Obedience, conformity, and social roles: Active learning in a large introductory psychology class. Teaching of Psychology, 28(4), 260-262. Bonney, K. M. (2015). Case study teaching method improves student performance and perceptions of learning gains. Journal of microbiology & biology education, 16(1), 21. Bonwell, C.C., and Eison, J.A. (1991). Active learning: Creating excitement in the classroom. Washington, DC: Jossey-Bass. Burgin, S. R., & Sadler, T. D. (2016). Learning nature of science concepts through a research apprenticeship program: A comparative study of three approaches. Journal of Research in Science Teaching, 53, 31-59. Cherney, I. D. (2008). The effects of active learning on students’ memories for course content. Active Learning in Higher Education, 9, 152-171. Driver, R., Leach, J., & Millar, R. (1996). Young people’s images of science. London: McGraw-Hill International. Ellis, S., Carette, B., Anseel, F., & Lievens, F. (2014). Systematic reflection: Implications for learning from failures and successes. Current Directions in Psychological Science, 23(1), 67-72. Erduran, S., & Dagher, Z. R. (2014). Reconceptualizing nature of science for science education. In Reconceptualizing the Nature of Science for Science Education (pp. 1-18). Springer Netherlands. Foulds, W., & Rowe, J. (1996). The enhancement of science process skills in primary teacher education students. Australian Journal of Teacher Education, 21(1), 2. Hackling, M., & Garnett, P. (1992). Expert—Novice differences in science investigation skills. Research in Science Education, 22, 170-177. Heos, B., & Comins, A. (2013). Stronger than Steel. Boston, MA: Houghton Mifflin Book for Children. Herreid, C. F. (2015). Testing with case studies. Journal of College Science Teaching, 44(4), 66-70. Jimenez-Aleixandre, M., Rodriguez, A., & Duschl, R. A. (2000). ‘‘Doing the lesson’’ or ‘‘doing science’’: Argument in high school genetics. Science Education, 84, 287–312. Kuhn, J., & Müller, A. (2014). Context-based science education by newspaper story problems: A study on motivation and learning effects. Perspectives in Science, 2(1-4), 5-21. Marton, F. (2006). Sameness and difference in transfer. The Journal of the Learning Sciences, 15, 499-535. McComas, W. F., Clough, M. P., & Almazroa, H. (2002). The role and character of the nature of science in science education. In McComas, W.F., The nature of science in science education (pp. 3-39). New York, NY: Springer. National Research Council. (2007). Taking Science to School: Learning and Teaching Science in Grades K-8. Duschl, H.A. Schweingruber, and A.W. Shouse. Washington, DC: The National Academies Press. National Research Council. (2012). 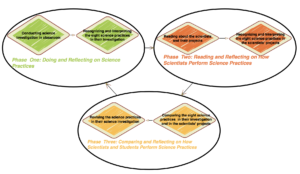 A Framework for K-12 Science Education: Practices, Crosscutting Concepts, and Core Ideas. Committee on a Conceptual Framework for New K-12 Science Education Standards. Board on Science Education, Division of Behavioral and Social Sciences and Education. Washington, DC: The National Academies. Smith, C. V., & Cardaciotto, L. (2011). Is Active Learning Like Broccoli? Student Perceptions of Active Learning in Large Lecture Classes. Journal of the Scholarship of Teaching and Learning, 11(1), 53-61. Smith, M. U., & Scharmann, L. (2008). A multi-year program developing an explicit reflective pedagogy for teaching pre-service teachers the nature of science by ostention. Science & Education, 17, 219-248. Tichenor, L. L. (2013). Assessing Learning Outcomes of the Case Study Teaching Method. In R. E. Yager, Exemplary College Science Teaching (pp. 91-106). Arlington, VA: NSTA Press. Windschitl, M., Thompson, J., & Braaten, M. (2008). Beyond the scientific method: Model-based inquiry as a new paradigm of preference for school science investigations. Science education, 92, 941-967.